yes please and thank you!! When are you releasing the AE? Would like to purchase one of these. Love this! Sigh me up. this print is absolutely fantastic! I can’t wait to find 1 at a fair price!I can’t wait to find 1 at a fair price! Awesome work! Two of the best I have seen in a long time. Marq, these prints look great! Would love one of these! Thanks! Please yes on this one!! Would love to add a set to my collection. Thanks for the great gig prints!!!! These are the best of the tour by far. Would love a chance at a set. when are these beauties gonna sell… I need I want lol.. I love both nights! They would look great as a pair! Spectacular work Marq! 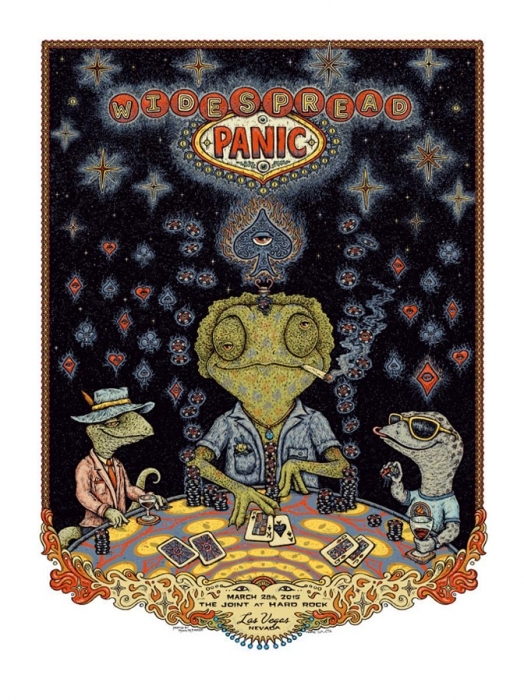 Totally captures the magic and energy of Las Vegas and Widespread Panic! Awesome! Best prints from entire West Coast leg….beautiful work Marq. I was lucky to get night one in LV, but didn’t get night two. Would love a chance to complete my set. Please add me to any list for additional information pertaining to a drop or opportunity to purchase night 2.
quite a pair these 2 prints, file under MUST HAVE. Best poster I’ve seen in a few years! My Girlfriend and I stood in line both nights and purchased #50 and #53… Sadly the man driving us back from the airport did not remove them with my luggage,,we were half asleep and we lost them… I called the company and they said there was no poster box in the trunk….that’s a lie because my girl handed the driver the box! Any help on repurchasingnthese would be most appreciated! Double down on this set! Went to both nights in Vegas but wasn’t able to purchase either print… I traveled from Alabama and would really like these prints to remember the trip by, if and when they are released again I would love to know so I can hang these on my wall! Really hope to get one of these! Would look great next to the first night. I would really like to have one of these, I am missing both nights and would be thrilled just to get one. Deal me in for one of these sweet looking pieces of art! Great work! Would love to purchase both. Thanks! Winner Winner Chicken Dinner !!!! Love this print. All I can think of is Fear & Loathing and Rango. Hope I can get one! Please include me for the lottery for the set. Black Jack me please! Love to buy a copy. hoping to get this, as always, awesome work Marq!! Excellent work as always. Hoping to be one of the lucky ones. Would love to win the Lottery! Vegas style!!! amazing, add me to the lottery please. Please add me to the lottery! This thing is awesome! Awesome! Please add me to the lottery! Love all the little details! Cant wait for the fun!! Took the wifey to these shows as a surprise birthday. We were unable to get the posters due to dinner dates. Come on lotto!!!!! Would look right next to my wood Fillmore. Awesome prints!! Please enter me in the lottery for both, would love these! The subtle details are amazing! I love how the chameleon’s skin mimics the different card suits. The blue and black background colors look great. The lettering ties in perfectly and is my favorite part!. Very satisfying gig poster!